Pix2Fone is a free extension for Internet Explorer and Mozilla Firefox combined with online service. 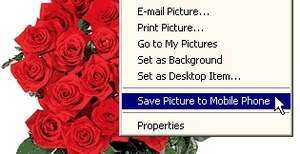 It adds "Save Picture to Mobile Phone" option to the browser and lets you save any photo from your PC or internet as your mobile / mobile / cell phone wallpaper. Picture resizing / cropping tool and special image enhancement mode create perfect wallpapers, backgrounds or screensavers for virtually any modern phone with color display. For security reasons, you should also check out the Pix2Fone Browser Extension download at LO4D.com which includes virus and malware tests. Additional screenshots of this application download may be available, too.